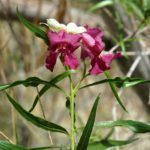 The desert willow is a little tree that adds color and fragrance to your backyard; provides summer shade; and attracts birds, hummingbirds and bees. The long, slender leaves make you think of willow, but once you learn some desert willow tree facts, you’ll see that it is not in the willow family at all. 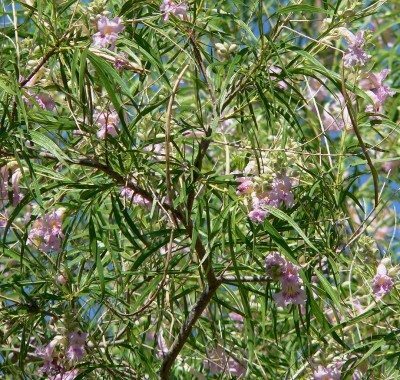 The desert willow’s scientific name is Chilopsis linearis. It’s a small, delicate tree that usually doesn’t grow above 30 feet tall and 25 feet wide. This makes planting desert willow trees possible even for those with small backyards. With its many trunks, the tree presents a unique, graceful silhouette that is familiar in the Southwest deserts. The thin, drooping leaves can get up to 12 inches long, filling in the irregular crown of the tree with willowy softness. The fragrant trumpet flowers grow in clusters on the branch tips and bloom from spring through fall. They can be found in shades of pink, violet and white, all with yellow throats. Planting desert willow trees is rewarding and easy if you live in USDA hardiness zones 7b through 11. When placed in a location beside your home, the trees offer summer shade but allow ambient heating in the colder months. Consider planting desert willow trees in groups if you need a privacy screen or windbreak. This kind of grouping also offers shelter to nesting birds. What is a desert willow if not an easy tree to grow? Learning how to grow a desert willow is not difficult since it is readily cultivated. The seeds in the long, thin pods grow so readily that the tree is considered invasive in some areas. Planting desert willow trees from cuttings is also possible. One of the most interesting desert willow tree facts is that the seeds establish themselves in newly deposited river sediments after seasonal flowing. The young trees trap and hold soil sediment as their roots grow, creating islands. When you are trying to figure out how to grow a desert willow, remember that the tree is native to the desert. Think full sun and soil with excellent drainage when growing these trees in your landscape. If your region gets more than 30 inches a year rainfall, plant desert willow trees in raised beds to ensure drainage. As you are gathering desert willow tree facts, don’t forget how easy the tree is to maintain. Caring for a desert willow once it is established is a snap. Like other desert plants, the desert willow only needs a very occasional, deep irrigation. It is pest and disease free and requires little pruning.